It seems as though it has been years since I have been able to get my head above water. Raising children is wonderful, but it has almost drowned my enological focus. Perhaps it was youthful folly, but I used to pride myself in my ability to imagine what my life might be like in five or ten years. 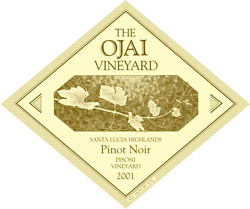 These days I am taking stock of what we are doing here at The Ojai Vineyard, and, although we have had some level of success, I am sure we can do better. And, in that vein, I plan on phasing out some of the vineyards that are problematic for me. Pisoni, is, of course a very special vineyard, and it has been a delight to work with Gary and his sons. But for me, making wine is not just showing up on harvest day and watching the grapes being picked; it is an involvement in every detail of a vineyard’s growth through the year. I would like to believe I could visit Pisoni often during the growing season, but due to the distance from the winery, I just do not have the time. So to better focus on the vineyards closer to home, I have decided that this will be the last Pisoni pinot from us. To walk away from acknowledged success is the difficult part, but the good news is that this might be our best Pisoni to date. While the 2000 has a delicacy that works great, the 2001 has the combination of amazing intensity and excellent balance–a rich and hedonistic wine that, while delicious today, will age nicely for many years.